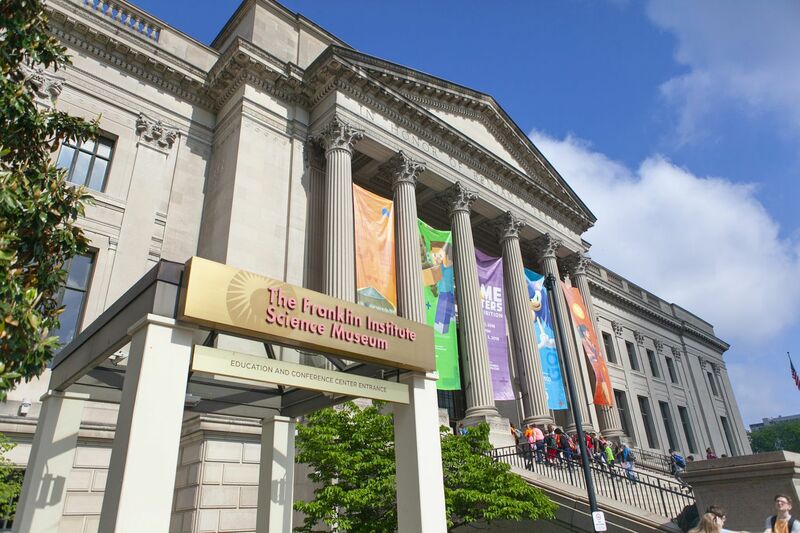 The Franklin Institute is a science museum.MIGUEL MARTINEZ / BILLY PENN. One of the best benefits of being a college student is getting a discount virtually everywhere, from clothing stores to museums. Campus Philly goes the extra mile for college students, providing free admission with its College Fest on Sept. 8 to some of Philly's best museums. Even better, Sept. 22 is Smithsonian Museum Day, when many Philadelphia museums provide free admission for all. But these aren't the only times you can experience Philly's great cultural institutions at no charge. Here is our comprehensive list of recurring free days, one-off free events, and big discounts available at Philadelphia's museums. When it's (almost) free: Admission to the world-renowned collection is pay-what-you-wish 10 a.m.-5 p.m. the first Sunday of every month and 5 p.m.-8:45 p.m. every Wednesday. And, no, a museum spokesperson explained that you cannot pay nothing, so technically the minimum admission fee is one cent on pay-what-you-wish days. Kids' admissions: Free at all times for children under 13. Student free ride: Art and design students at nine local colleges can attend free anytime but need to pay for ticketed special exhibitions. Students studying art at non-art-exclusive colleges and universities can add a sticker to their ID which verifies that they are art students. Pro tip: Different days attract different crowds. Sundays see more families and younger children, while Wednesdays bring in a young adult crowd. Although Wednesdays do not include the Perelman Building like Sundays do, they are far less crowded. If you choose to visit for a first Sunday, be sure to avoid the midday lunch rush from around 11 a.m. to 2 p.m., when lines are longest. 2600 Benjamin Franklin Parkway. 215-763-8100. www.philamuseum.org. When it's (almost) free: Admission to the largest collection of Rodin's work outside of France is pay-what-you-wish at all times, with the same caveat that you must pay at least 1 cent, however, its garden and courtyard are free year-round. Pro tip: Although the PMA and the Perelman Building are closed on Mondays, the Rodin is open, and is closed on Tuesdays instead. According to a spokesperson, mornings (10 a.m. to noon) and the end of the day (4 p.m. to 5 p.m.) are quiet times to visit, although this smaller museum rarely gets too crowded, and visits are estimated to only take 30 minutes to an hour. 2151 Benjamin Franklin Parkway. 215-763-8100. www.rodinmuseum.org. When it's free: The Barnes offers free admission on first Sundays from 10 a.m. to 5 p.m. to the entire collection, as well as family activities and performances. Stop by on Oct. 7 for the free Barnes on the Block party, which will include a beer garden, DJ, food trucks, and more. Student (almost) free ride: $5 admission for students on weekdays, and free for Philadelphia K-12 teachers on Sundays. College night is a free party for college students at the Barnes on the evening of Nov. 9 and will include "light bites." The museum also offers free student admission to lectures and symposiums — the next symposium will be about fashion and feminism, and the next lecture will feature Leslie Bowen's reflections on being a female artist. Students also have a $10 discounted ticket to First Fridays which include performances (the next one will be centered on Afro-Brazilian traditions) and the same discount for the triannual Artist Bash and the new Barnes Takeover, a performance night in response to the collection (information will be up shortly online). Pro tip: Kathleen Ogilvie Greene, curator of public programs, advises visiting on Fridays, because the programming lures crowds out of the collection, making it much less crowded. She also advised that students come on weekdays, not only for reduced fare admission but because "the reality is weekends are when we are packed." 2025 Benjamin Franklin Parkway, 215-278-7000. www.barnesfoundation.org. When it's free: PAFA's museum is free on Sundays for the duration of the Rina Banerjee exhibit from Oct. 27 to March 31, 2019. The Alumni Gallery, Community Education Gallery, and Morris Gallery are always free as well. Come for the Spring Festival on May 20 from 2 to 4:30 p.m. for free admission. Some library memberships also include free admission. Kids' admissions: Free at all times for children under 12. Student free ride: Students from Art Institute of Philadelphia, Community College of Philadelphia, Delaware College of Art and Design, Drexel University, Haverford College, Hussian College, La Salle University, Rowan University, Rutgers University, St. Joseph's University, Temple University, Thomas Jefferson University, University of Delaware, University of Pennsylvania, University of the Arts, and Ursinus College have free admission with a valid student ID. Pro tip: If you stop by on a Sunday, you can also attend Family Arts Academy, a weekly free program where families can meet artists and work on an art project. 118-128 N. Broad St., 215-972-7600. www.pafa.org. When it's free: This museum is free for all, at all times. Groups of 10 or more must fill out a group visit form at least 24 hours in advance. Pro tip: Weekdays are always smart days to visit as opposed to weekends. Institute of Contemporary Art, University of Pennsylvania 118 S. 36th Street. 215-898-7108. icaphila.org. When it's free: This enormous, family-friendly science museum's monthly community nights have free admission. They are on Tuesdays — Sept. 18, Oct. 16, and Nov. 20 — starting at 5 p.m. Kids' admissions: Children under 3 are admitted free, children under 13 pay $19. Pro tip: Come early on community nights to avoid a crowd and don't forget that on-site registration is required. A spokesperson for the museum recommends visiting in the early afternoon and purchasing tickets in advance if visiting on a full-priced admission day. The Franklin Institute, 222 N. 20th St., 215-448-1200. www.fi.edu. When it's free: Dinos After Dark is a monthly pay-what-you-wish evening that also includes family-friendly activities and a beer garden. In the fall, Dinos After Dark will be from 4 to 8 p.m. on Sept. 28, Oct. 26, and Nov. 23, and the beer garden will be open until 10 p.m. The museum is also participating in Smithsonian Museum Day, on Sept. 22, when admission will be free all day (not including the special exhibits and butterfly garden). Kids' admissions: Children under 3 are admitted free, children under 13 pay $15.95, or $13.95 online. Student free ride: Drexel students can visit for free. Pro tip: Registration for Smithsonian Day isn't required, but if you do register online beforehand, you won't have to wait in line. 1900 Benjamin Franklin Parkway. 215-299-1000. ansp.org. When it's free: This museum is participating in Smithsonian Day on Sept. 22, and is requiring registration. Kids' admissions: Children under 6 attend free, children under 18 pay $10. For the summer, everyone can pay the discounted fee of $10. Pro tip: The museum is quietest in the afternoons after 2 p.m., and on weekends, when there are no noisy school groups. On Saturdays and Sundays, there are also free guided gallery tours at 1:30 p.m. and 2:30 p.m.
3260 South St. 215-898-4000. www.penn.museum. When it's free: The museum has a free quiet play event for families with children on the autism spectrum every two months. The next event will be on Oct. 19 from 5 p.m. to 7 p.m. and will be a quiet playtime with noise-canceling headphones available. First Wednesdays of every month offer a big discount with tickets priced at $2 for the day. Kids' admissions: Children under 1 are admitted free. Pro tip: If you decide to come for the free quiet play event, be sure to register on their website ahead of time. For general admission, Mondays are the quietest day to visit because there are no school groups on those days. Memorial Hall, 4231 Avenue of the Republic. 215-581-3181. www.pleasetouchmuseum.org. When it's free: Veterans Day weekend (Nov. 10-12) is free for veterans and active or retired military. Kids' admissions: Kids under 6 are admitted free, and those under 18 receive discounted tickets for $12. Pro tip: Afternoons around 2 or 3 p.m. are usually best, and Wednesdays are the museum's least busy day. Also, paid tickets are valid for two days, so you can look at that as one free day. 101 S. Third St. 215-253-6731. www.amrevmuseum.org. When it's free: The center is often free on civic holidays, and the next free day will be Constitution Day, Sept. 17th. Kids' admissions: Children under 6 are admitted free. Pro tip: Visit in the morning, as free days usually include programming which starts early. Constitution Day starts with a flag-raising at 8:30 a.m., but visitors would be wise to stick around because at 12:15 p.m. there will be cake in honor of the Constitution's birthday. 525 Arch St., 215-409-6600. constitutioncenter.org. When it's free: The museum hosts the Delaware River Festival on Sept. 15, when guests can paddle Penn's Landing for free from 11 a.m. to 4 p.m. (although the museum is still full price). On Smithsonian Museum Day, guests have free entry to the museum and ships from 10 a.m. to 5 p.m. as long as they register ahead. One registration admits two guests. Kids' admissions: Children under 3 are admitted free. Children under 13 receive a $12 discounted ticket. Pro tip: Most free events are scheduled on the weekends so they coincide with other family programming, like Seafaring Saturdays, kids events from 11 a.m. to 1 p.m., and public demonstrations in the Citizen Science room, weekends at 11 a.m., 1 p.m., and 3:30 p.m. Special events also bring in a bigger crowd, so give extra "cushion time" to move through the museum (a normal visit time is around an hour and a half). Peak visiting time is usually 11 a.m. to 2 p.m.
211 S. Columbus Blvd. 215-413-8655. www.phillyseaport.org. When it's free: The Searchlight Series is the first Tuesday of every month from 6 to 7 p.m. The series of talks and discussions focuses on issues in contemporary corrections, is free and includes late hours at the Penitentiary. The third Sunday of every month is "191 free 0" (say it out loud), a day where residents of the 19130 zip code can visit for free. Kids' admissions: School tours are free for the Philly School District. Pro tip: "Weather definitely impacts the experience," said Sean Kelley, senior vice president. He advised coming on a day with good weather, as being in the old building isn't quite the same as being inside. 2027 Fairmount Ave., 215-236-3300. www.easternstate.org. When it's free: There are many free events at the African American Museum: Macy's Family Fun Day is every second Saturday, from 10 a.m. to 5 p.m., free for the first 250 visitors. ArtBreak is every third Thursday, from 12:30 p.m. to 1:30 p.m., free with RSVP, and is a curator and artist-led lunchtime tour of the museum's special exhibition galleries. The free opening reception for Cotton: The Soft, Dangerous Beauty of the Past will be Sept. 14 at 6:30 p.m. Kids' admissions: Children under 4 are admitted free, children under 13 have a reduced fare of $10. Pro tip: For Family Fun Days, it is best to come early to ensure free entry, as only the first 250 get in free. The museum opens at 10 a.m., and programming goes from 11 a.m. to 4 p.m.
701 Arch St. 215-574-0380. www.aampmuseum.org. When it's free: The museum is free on Martin Luther King Day, President's Day, and Independence Day. Kids' admissions: Children under 13 are admitted free. Children under 22 have a reduced fare of $13. Pro tip: Come early on special event days, as the museum tends to fill up. Doors open at 10 a.m.
101 S. Independence Mall East. 215-923-3811. www.nmajh.org. When it's free: The Wagner Institute is always completely free, although donations are encouraged. Pro tip: The institute hosts free evening lectures, usually around 6 p.m., where the museum is open late, presenting a potentially less busy time to visit. The fall harvest festival on Oct. 6th from noon to 4 p.m. is another nice time to visit. All of the museum's events and late hours are available online. 1700 W. Montgomery Ave. 215-763-6529. www.wagnerfreeinstitute.org. When it's free: This museum is free and open to the public, with the exception of certain special events. There are a number of free events, however, such as their Saturday Speaker series which includes free tea and coffee, and drop-in tours on the final Saturday of each month from 2 to 3 p.m., which enhance a visit (more information about events can be found online). Pro tip: The museum is much less crowded midweek. Saturdays are often busier, but they also include programming, which may be a draw. 315 Chestnut St. 215-925-2222. www.sciencehistory.org. When it's free: The Swedish History Museum has two recurring free days: Smithsonian Museum Day on Sept. 22, and Swedish National Day on June 6, when there are also activities and food available. Kids' admissions: Children under 5 are admitted free, children under 12 are admitted for a reduced fare of $5. Pro tip: This niche museum usually isn't very crowded, so it's a good spot to visit on a weekend without the risk of a long wait or packed gallery. 1900 Pattison Ave. 215-389-1776. www.americanswedish.org. When it's free: Fort Mifflin is participating in Smithsonian Museum Day on Sept. 22, which will be women's history-themed this year, with a female civil war surgeon demonstration — be sure to stop in the gift shop to get your wristband for free admission. Kids' admissions: Children under 6 are admitted free, children under 13 have a reduced fare of $4. Pro tip: There are free guided tours at noon and 2 p.m., and if you visit around lunch there is a riverfront picnic area with a great view. Fort Mifflin and Hog Island Roads. 215-685-4167. fortmifflin.us.